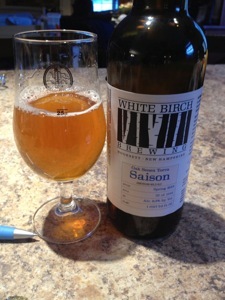 These are some long, long, long over due tasting notes of my first saison. As I mentioned in the brewing notes, I feel close to this style due to my heritage, having a small farm, and the open interpretation that is allowed with this style. Saisons are an interesting style. The saison style originates in the farm houses of Wallonia and was made with fresh hops, grains, a variety of adjuncts, and spices varying from farm to farm. It was the beer served to the farm hands and was likely a lower abv and had mixed fermentation. From my understanding the style has only a few strong requirements, high carbonation, very low FG, moderate yeast esters and phenols. The style is way more wide open than the BJCB guidelines suggest. I’ve enjoyed examples hopper, much lighter and darker, as well as much lower and higher ABV. Not to mention versions with brett or other mixed fermentations. Some of the best ones I’ve had have been brett fermented. The end result is an ok first attempt. Serving it, the carbonation could surely use a bump. However, my system is balanced for 2.3 volumes, so it’s not easy for me to get the right volume of co2 into this beer. It also didn’t seem to dry out enough. I measured an FG of 1.008, but it tasted like it had more body than that. The color was just too ‘brown’, I really love the traditional orange color you see in some saisons, and would lean to straw to red, over over brown. The beer had so much body I dry hopped in the keg ‘dry’ it out.With such an open style, it can be hard to find a direction to follow, and it can result in an unfocused beer. 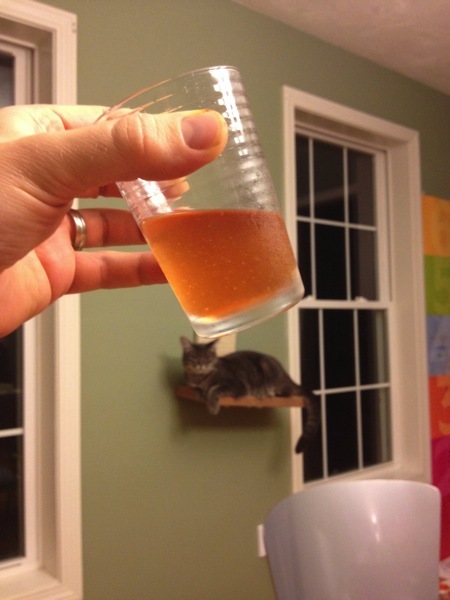 Despite having read Farm house ales I didn’t have a clear idea what I wanted to achieve with the recipe. 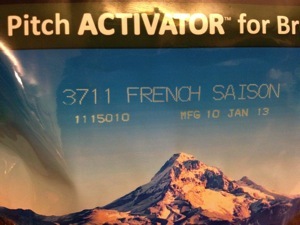 So I struck up a conversion at a BFD.org meeting with a member who is a regular saison brewer. He shows up with a few of his brett/wild/sour saisons each meeting. We initially planned on brewing and splitting a batch, but he lives on the other side of the state and the logistics didn’t work. However I did decide to use his recipe as a guide to try my hand at my first saison. Things I’d like to do next time:With that said, a year later, I still have half a keg of this beer. I haven’t given up on it yet, I don’t think the beer is flawed, it’s just not balanced where I want it to be. This beer is destined to be blended with the rye saison I added dregs too. I’m hoping it will add body and complexity to it. Once I determine my blend, I’ll then bottle condition the blended beer to get the carbonation up to 3 volumes. I’ll be slightly tricky to figure out the right amount to priming sugar to do that knowing the beer has mixed microbes, but I’ll be using some heavy duty bottles, so I don’t end up with bottle bombs. Hopefully before summer, this batch will be blended and bottled and I can move on with the next round of Saisons. I’d like to make a table saison with my own hops and local grain, I’ve also had the idea of a blood orange saision, and another mixed fermentation saison with either dregs from my first sour saison, or a select brett strain. 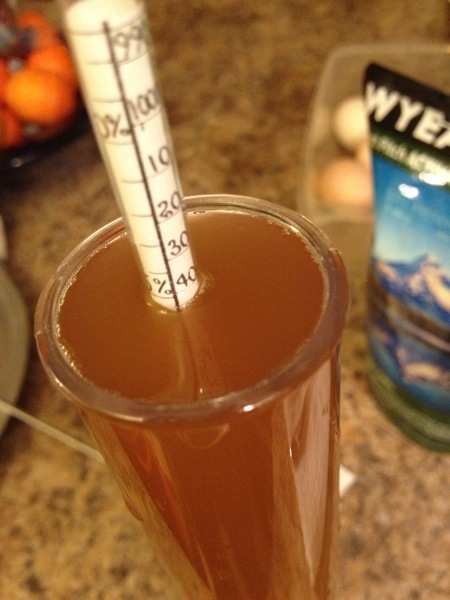 Use a different yeast strain: I used french saison 3711 this time, mostly because it was less easier to use. I’m having a success controlling fermentation temperature, and I can certainly raise it just fine making small batches and using my water bath. I also now have o2 and can achieve the higher oxygen requirements of some fo the more finicky strains. I also want to go in the direction of lighter and smaller, something like this http://beersmithrecipes.com/viewrecipe/219842/petite-bourgeoisie-saison. Chat Absent Saison brew log Peppliner Weisse tasting notes Pales in Comparison tasting notes Homebrew Tasting Notes: AHS Oatmeal Stout Brewing Log: Rye Saison with wild dregs.